The British set up a trading post near present-day Freetown in the 17th century. Originally the trade involved timber and ivory, but later it expanded into slaves. 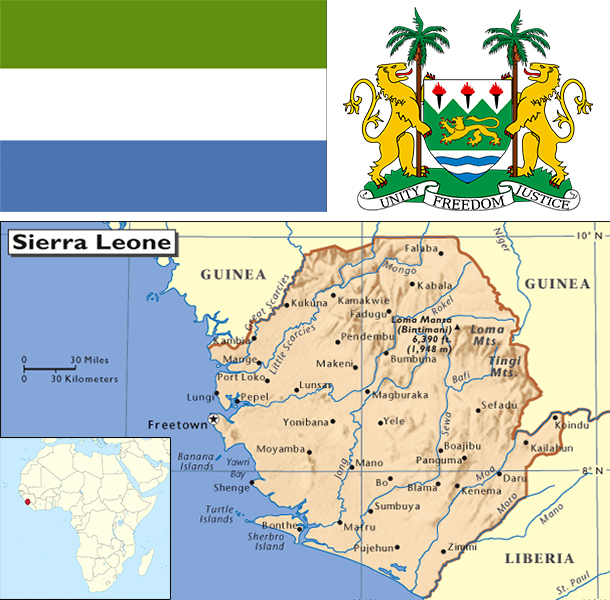 Following the American Revolution, a colony was established in 1787 and Sierra Leone became a destination for resettling black loyalists who had originally been resettled in Nova Scotia. After the abolition of the slave trade in 1807, British crews delivered thousands of Africans liberated from illegal slave ships to Sierra Leone, particularly Freetown. The colony gradually expanded inland during the course of the 19th century; independence was attained in 1961. Democracy is slowly being reestablished after the civil war (1991-2002) that resulted in tens of thousands of deaths and the displacement of more than 2 million people (about one third of the population). The military, which took over full responsibility for security following the departure of UN peacekeepers at the end of 2005, is increasingly developing as a guarantor of the country's stability. The armed forces remained on the sideline during the 2007 and 2012 national elections, and deployed over 850 peacekeepers to the African Union Mission in Somalia. As of January 2014, Sierra Leone also fielded 122 staff for five UN peacekeeping missions. In March 2014, the closure of the UN Integrated Peacebuilding Office in Sierra Leone marked the end of more than 15 years of peacekeeping and political operations in Sierra Leone. The government's stated priorities include furthering development - including recovering from the Ebola epidemic - creating jobs, and stamping out endemic corruption. Sierra Leone is extremely poor and nearly half of the working-age population engages in subsistence agriculture. The country possesses substantial mineral, agricultural, and fishery resources, but it is still recovering from a civil war that destroyed most institutions before ending in the early 2000s. In recent years economic growth has been driven by mining - particularly iron ore. The country’s principal exports are iron ore, diamonds, and rutile, and the economy is vulnerable to fluctuations in international prices. In 2014, rapid spread of Ebolavirus caused a contraction of economic activity in several areas, including transportation, health, and industrial production. Iron ore production dropped, due to low global prices and high costs, driven by the epidemic. A long-term shutdown of the industry would badly hurt the economy because it supports thousands of jobs and creates about 20% of GDP. Until 2014, the government had relied on external assistance to support its budget, but it was gradually becoming more independent. The epidemic has disrupted economic activity, deterred private investment, and forced the government to increase expenditures on health care, straining the budget and restricting other public investment projects. A rise in international donor support will partially offset these fiscal constraints.